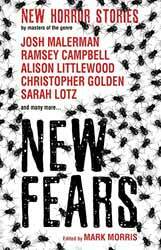 New Fears is a horror short story anthology, intended to be the first in a series of collections edited by horror writer Mark Morris. There are 19 tales across 400 pages. It is available in both paperback and eBook formats. The full content is as follows: The Boggle Hole, by Alison Littlewood; Shepherd’s Business, by Stephen Gallagher; No Good Deed, by Angela Slatter; The Family Car, by Brady Golden; Four Abstracts, by Nina Allan; Sheltered in Place, by Brian Keene; The Fold in the Heart, by Chaz Brenchley; Departures, by A.K. Benedict; The Salter Collection, by Brian Lillie; Speaking Still, by Ramsey Campbell; The Eyes Are White and Quiet, by Carole Johnstone; The Embarrassment of Dead Grandmothers, by Sarah Lotz; Eumenides (The Benevolent Ladies), by Adam L.G. Nevill; Roundabout, by Muriel Gray; The House of the Head, by Josh Malerman; Dollies, by Kathryn Ptacek; Succulents, by Conrad Williams; The Abduction Door, by Christopher Golden; and The Swan Dive, by Stephen laws. The Introduction is very entertaining as you might expect from the author of such novels as Toady, Mr Bad Face, and Longbarrow. Mark Morris reminds us of those days growing up with the Armada and Fontana horror and ghost story collections. I seem to remember even Marks and Spencer got in on the action with some hardback anthologies. No doubt, the big names such as Ramsey (The Nameless) Campbell, Stephen (Valley of Lights/Chimera) Gallagher, Stephen (The Frighteners/Daemonic) Laws, and Conrad (One/The Unblemished) Williams will be the main selling point. The outstanding tales for me here are The House of the Head (in which a decapitated head terrorises the family in a little girl’s dollhouse), The Abduction Door (in which a hatchway appears within the walls of a lift and a man’s daughter is taken), and Shepherd’s Business (in which a new doctor on an island is confronted with a macabre pagan trade). New horror shorts are always welcome. I have several author collections in my possession from the likes of M.R. James, H.P. Lovecraft and Edgar Allan Poe. Although a couple of examples in New Fears fall short of the mark (what on God’s Earth is The Embarrassment of Dead Grandmothers all about?!) I can confirm that this is truly a diverse set of stories. There is something on offer here to appeal to all followers of the genre – and hopefully a few acolytes.